Running, walking, biking, and places to do them. It was a cool morning and a morning for records at Tallahassee's Roberts Elementary School. 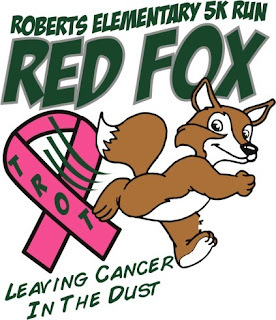 In the fourth annual Red Fox Trot 5K on Saturday, 19 January 2013, the winners set a new men's course record and a new women's course record. The number of finishers, 268, was also an all-time high for the race. Moments after the 8:00 AM start behind Roberts Elementary School, Stanley Linton was in the lead. That didn't change during the 3.1-mile tour of the Dublin Downs community; the Florida State University freshman returned to Roberts Elementary and the finish line with a 200-meter lead and a winning time of 16:10. Linton's time crushed the previous course record of 17:00, set at the 2012 Red Fox Trot by Lincoln High distance runner Trevor Touchton. Linton was followed across the finish line by runner-up Nate Kaiser in 16:53. Vince Molosky finished third in 17:18. Tallahassee's Jay Wallace was the fastest master runner in the Red Fox Trot, placing sixth overall in 17:52. The Red Fox Trot was Stanley Linton third win in the first three weeks of 2013, his previous victories coming in the Bowlegs 5K and the Gulf Winds Track Club 30K. In women's competition, Katie Showman had also opened the year with wins at Bowlegs and the GWTC 30K. At the Red Fox Trot, though, Micah Adriani finished nearly 50 meters ahead of Showman, placing 19th overall and winning the women's title in 19:36. Showman was the second woman finisher, 22nd overall in 19:47. Ashley Daily (30th, 20:42) was the third woman and Kristine Cox (33rd, 21:04) was the fourth. The fifth woman finisher, Thomasville, Georgia runner Mary Anne Grayson, was the top woman master in the field, placing 34th overall in 21:06. 2012 story, "Touchton and Hanlon set Red Fox records"
2011 story, "Tessier and Hanlon fox the field in the Red Fox Trot 5K"